In the wake of the Trafalgar Square riots, the Duke of Wellington himself, then in his seventy-ninth year, was called upon by his government to protect the nation once again. This time the Iron Duke was tasked with defending London against the dangerous radicals that were intent on marching en masse to Westminster to present a third petition once more calling for the adoption of the People’s Charter, that terrible document that gnawed at the very bones of our great democracy by daring to suggest that perhaps more than five percent of the adult male population should have the right to vote. The politicians need not have worried though, for the day of the proposed mass procession, Monday the tenth of April, was not, as many had genuinely feared or desired, the beginning of a revolution so much as the end of one. Much as I loved the ideals of the Chartists, it was obvious to me that even if they did have the five and a half million signatures on the thing that Feargus O’Connor claimed, it would not make a damn bit of difference to the government of the day unless it was backed up by a revolutionary army. This we did not have. The petition was a symbolic gesture, nothing more, a public protest against the obscene divide between the unbounded wealth and the hideous poverty that unevenly fractured the nation. We would certainly make some noise, but unless there was a spontaneous uprising of support in the capital, nothing would change. Those of us with long memories could recall the tortuous passage of the previous reform bills, which were fought tooth and nail by the establishment, when all the damn act did in the end was to clear away a few rotten boroughs which were laughably corrupt, even by contemporary standards, and give a few rights to property owners. 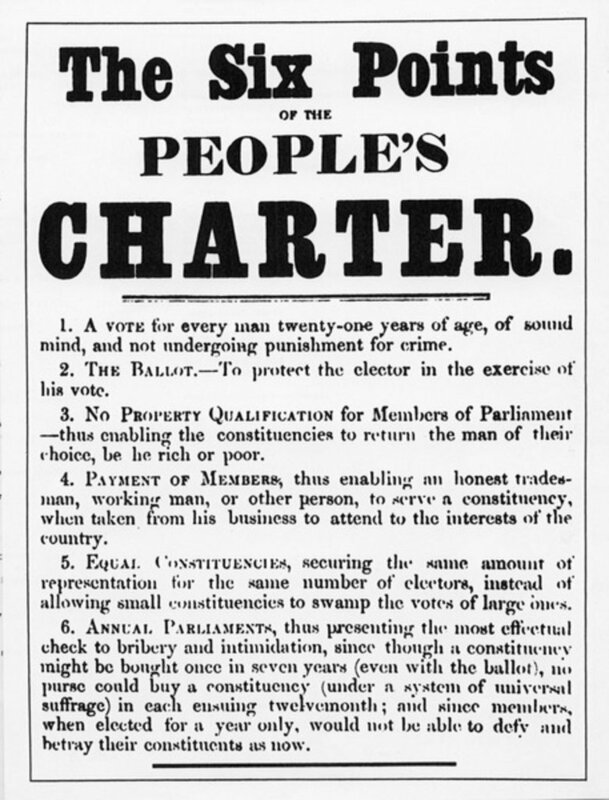 The Chartists wanted every man over the age of twenty-one to have the vote, with secret ballots and working class M.P.s. They might as well have been asking for a free dinner on Mars. I recall suggesting to Reynolds that he should also ask for votes for women, wage reform, affordable housing, cheap medicine, and free education, but he thought I was serious so my point fell rather flat. I went along anyway, against my better judgement given the Trafalgar Square fiasco, because some events are just too momentous to miss, especially if you call yourself a journalist, and also because, like everyone else in London that day, I wanted to know what was going to happen. Reynolds was a delegate, which gave me a reasonably privileged view of the proceedings. Feelings were mixed and uneasy at the rallying point, the Literary and Scientific Institution in Fitzroy Square, an independent library and meeting place for working men. It was a fine day, and by nine o’clock there was a large crowd gathered around the entrance, many wearing tri-colour rosettes of red, green and white, the colours of the National Chartist Convention. Some were ready for a fight, some feared one. No one seemed quite sure whether or not the march would happen at all, because every copper in London was on duty, supported by a legion of special constables, while it was known that all the public buildings and bridges were fortified and invested with soldiery. O’Connor was late, and rumours abounded that the traps had nabbed him already. The delegates and their aids (including me) milled around nervously in one of the upstairs meeting rooms overlooking the square, and much to Reynolds’ obvious delight he was called to the chair in O’Connor’s absence. After half an hour or so of waiting around, there was a commotion in the street below. This turned out to be a reaction to a messenger from Scotland Yard stoically making his way through the hostile crowd. He was a clerk rather than a peeler, or he was dressed as a civilian at any rate, which probably saved him from a beating. The message he bore was duly reported to Reynolds by the secretary, Mr. Doyle. It stated that the Commissioners of Police were instructed to inform the Chair that the government was agreeable to the petition being presented to the House of Commons, but that no accompanying procession would be allowed to take place, or be permitted to proceed through the streets of the metropolis. With powder and shot, I thought, lots of powder and shot. He said that well, I thought. There was widespread approval from the floor. The other delegates nodded, even Jones, to give him his due. It would seem that we were for a fight after all. I thought of Trafalgar Square and my heart sank. I wasn’t the right sort to die for a cause. At that moment O’Connor finally arrived and, at a stroke, everything changed. Reynolds retired in silence, and O’Connor took the chair, informing us there assembled that as this was the last morning the Convention would sit before the presentation of the great petition, he wished to make ‘a few observations.’ The room fell at once into a reverential silence. This was a somewhat conciliatory tone for the firebrand who had at once galvanised and divided the original movement by advocating physical force; the man who had done hard time for the cause in York Castle, the founder of the Northern Star and the National Land Company. He looked genuinely troubled. Not afeared, but certainly conflicted. This was not what any of us expected to hear, and there were several audible sighs that I can only ascribe to disbelief around the room. I, for one, was quite relieved. He paused to let his words sink in. It was Jones who first broke the silence. ‘If we back down now,’ he said, ‘then we lose all credibility as a mass movement.’ Several delegates, including Reynolds, nodded in agreement. ‘I have heard it said,’ replied Jones, ‘that the police have put it about that you are marked out for a bullet should there be any trouble.’ He left the implication hanging. ‘As are you, Ernest,’ said O’Connor. ‘Hear, hear,’ said Reynolds, indicating that enemies can become friends under certain circumstances. These sentiments were once more received with general applause, and a resolution was immediately passed adjourning the meeting to the common, as arranged. O’Connor slumped in his chair, obviously exhausted, but he did not object. O’Connor climbed in first, assisted by marshals in rosettes, followed by the other senior delegates, Reynolds, Jones, Harney, McGrath, Clark, Wheeler, and Hunter. The rest of us scrabbled in inelegantly behind them, and the cortège lumbered off amidst loud cheers from the by now huge crowd around the Square. 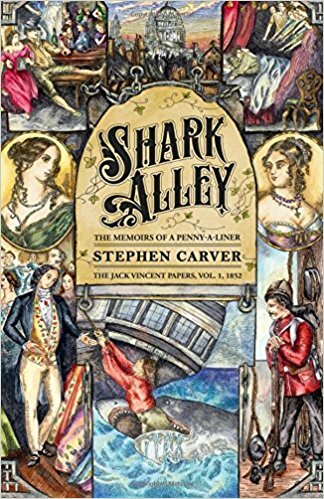 I was reminded of Jack Sheppard on his final journey to Tyburn. We passed along Goodge Street into Tottenham Court Road, and then travelled the length of the High Street to the National Land Company’s office in Bloomsbury, from which five huge bales or paper, comprising the great petition, were brought out by brawny men who were nonetheless struggling like schoolboys under the weight of too many library books. These were secured on the first cart. The scene was more comic than dramatic, but we all cheered and threw our hats, anyway. Again the cavalcade moved forward, the crowd increasing the train at every step. The windows of the houses in New Bridge Street were filled with spectators, and, amidst much applause, the moving mass took an onward course across Blackfriars Bridge. At this time a detachment of the battalion of Pensioners, under arms and fully accoutred, were observed to have landed at the City Pier, and on reaching the Surrey side of the river, the first display of the civil force appeared, and we saw the uniforms of both the Metropolitan and the City Police. ‘Now we’ll see some sport,’ said the man from the Illustrated London News. The general atmosphere, however, remained carnival, and everything seemed peaceful and well conducted. At the Elephant and Castle, a new mass joined in the rear of those who had followed the train from Fitzroy Square. As I looked back at them, all marching eight abreast like a People’s Army, I was amazed by their numbers. It is difficult to estimate such things, but I would calculate that there were not tens but hundreds of thousands in that procession, regardless of what you might have later read in the Tory press. We reached Kennington Common just before midday, joining up with several thousand more people, already assembled having arrived from their different rendezvous some time previously. I could see members of the Irish Confederation, and the various bodies of the trades of London, each group distinguished by its emblematic banner. The Irish, for example, displayed a splendid green standard emblazoned with the motto ‘Erin go bragh.’ Our appearance was hailed with loud and continued cheering, and as friends and allies met in one vast throng you could almost believe that the British Working Class Movement had some chance of success. This was as long as you did not look too closely at all the special constables that flanked the crowd, clearly identifiable by their white armbands, many of whom were dressed in the habiliments of working men, clerks and shopkeepers; just the men, in fact, that you would expect to have been supporting our cause. You notice things like that when you’re a tailor by trade. As soon as the carts had come to a stop a senior copper was on hand, conveying a request from the Commissioners of Police to O’Connor that he join them for a private chat at the tavern on the south side of the common, where they had set up shop with the local magistrate. He struck off across the common with another delegate, McGrath, in tow, strolling alongside the policeman and chatting. If not for the surrounding crowds, probably around the same in number as the population of a small city, you might have taken the odd delegation for three old friends engaged upon their daily constitutional. As had happened that morning, when O’Connor had been inexplicably late in arriving, a cry went forth that he had been arrested. Dr. Hunter, speaking from the cart (which had now, as planned, become the stage), set the matter at rest, and in a short time O’Connor and McGrath were observed wending their way back through the crowd, pausing frequently to shake hands or exchange a few words with supporters. After the customary formalities that always made Chartist meetings, great or small, so byzantine (motions tabled and seconded, chairs appointed, the secretary’s speech, and so forth), O’Connor finally presented himself, having previously been in a heated private conference with his fellow delegates at the back of the cart. He stood proudly upon the makeshift stage, smiling amidst the prolonged cheers of the multitude, the slogans of the movement fluttering behind him, and looked every inch the great statesman he was, even when going down in defeat, although we did not know it then. The cheers were deafening. He then went on to assure all present that he had nothing that he had ever said or done to retract. ‘If, indeed, I was to withdraw anything,’ he said, ‘I would be a most unfit and improper member of a movement such as this.’ Another ovation followed of such a length that my reporter’s eye started to wander. I noticed for the first time that Reynolds and Jones were both silently weeping. If at that moment he had called on us to storm the barricades and take Parliament by force I don’t think a man or woman among us would have done anything other than lay down their lives for the cause. Instead he asked us to peacefully disperse. Many then called that we should fight and, if necessary, die for the cause, like our brothers and sisters in France. O’Connor did his best to sooth this feeling, offering instead a compromise in which he, as the Executive of the National Chartist Association, would convey the petition to the House of Commons and present it on the members’ behalf; to preserve, he concluded, the lives of those who were jeopardised, and so that the cause which was so near and dear to his heart might not be injured. O’Connor then left the platform, accompanied by considerably less enthusiastic applause that had heralded his arrival. Ernest Jones then addressed the meeting. He said that although he was what was called a physical force Chartist, it was useless for them to engage in a violent confrontation for which they were wholly unprepared. Even though it was unlikely to have been otherwise, Jones’ support for O’Connor’s position was decisive, I think, in averting a riot. ‘If we behave with honour and forbearance this day,’ he concluded, ‘then our eventual success is certain. The government must recognise the rights of the working classes in England, as they had been compelled to recognise them in France and elsewhere.’ This seemed to rouse the assembly, for the cheering regained its former volume once more. O’Connor then again came forward, and asked the meeting to give him authority now to wait upon Sir George Grey, the Home Secretary, and to tell the right honourable baronet that the people were determined not to come into collision with any armed force, police or military; and that they were resolved to keep the peace inviolate that day. The meeting at once responded to this demand in the affirmative, and O’Connor quit the cart in the company of McGrath. Both men then began walking back in the direction of the tavern turned police station. The crowd parted in silence, some of the members patting O’Connor on the back or shaking his hand, others scowling. The meeting was then declared to be dissolved at a quarter past one. The five large bundles forming the petition were removed from the carriage and placed in cabs, and taken in charge of the Executive Committee to the House of Commons. The remaining delegates then mounted their carriage, which was dismantled of its trimmings and decorations, and left, followed by the empty cart that had carried the petition. [i] Jack’s description of the Kennington Common rally tallies quite closely with other contemporary reports, for example those in the Manchester Guardian, the Illustrated London News, the Northern Star, and R.G. Gammage’s History of the Chartist Movement, 1837-1854 (1854); although, as he later notes, estimates of the size of the crowd varied wildly.